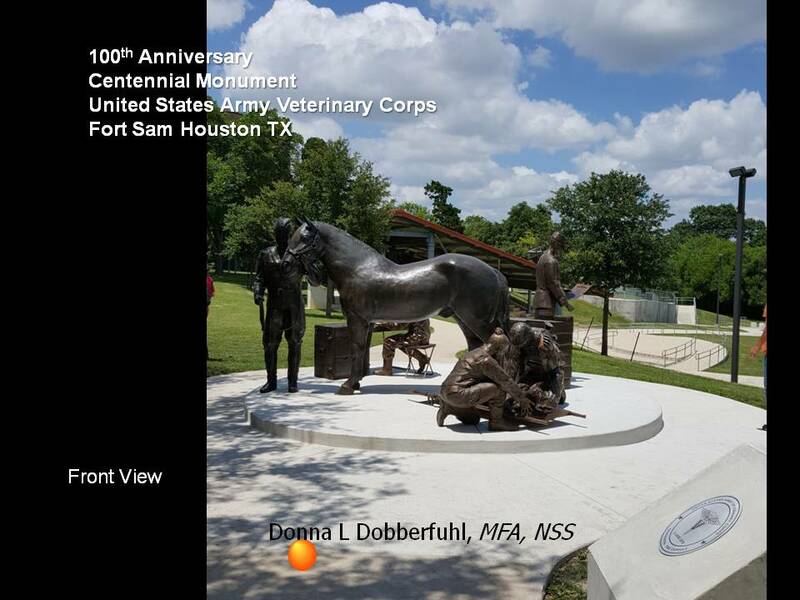 Donna L. Dobberfuhl, MFA, ACLS, NSS, is the author of the National POW Memorial in Andersonville GA.
Donna’s studio, Sculptural Designs Atélier, has completed design projects in a wide variety of fields including education, government, medical, military, religious, zoological as well as private firms and individuals. 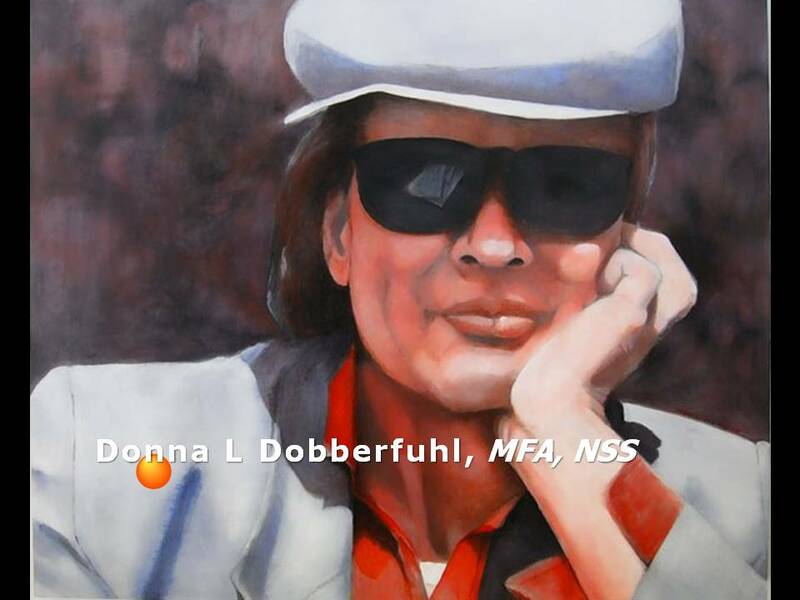 Donna works in several different media: traditional materials of bronze, water and mosaic; the contemporary material of steel, copper and cast stone and the 5,000-year old process of carved brick, offered in both natural-finished material and the fired pallet of earth tones. This diversity of media brings broad dynamic choices to her project designs. How will it work in my environment? This portfolio offers a few examples of my fine art in the home & office environment. My hope is that these examples will spur your own imagination. Enjoy! If not now -- When? The Fabric of Frisco© is now installed in front of the Frisco TX City Hall. I used stylized interpretation for this project. It is composed of two free-standing sculpted brick towers celebrating the foundational roots of the City of Frisco ("Agriculture") and its future ("Education"). Each tower is capped with 7' diameter copper canopy tops. terrigena sed infinitus© was commissioned by Northwest Florida State College for the school's Learning Resources Center. Working with architect David Alsop, Sam Marshall Architects, Donna designed and sculpted four exterior panels for the LRC's breezeway. 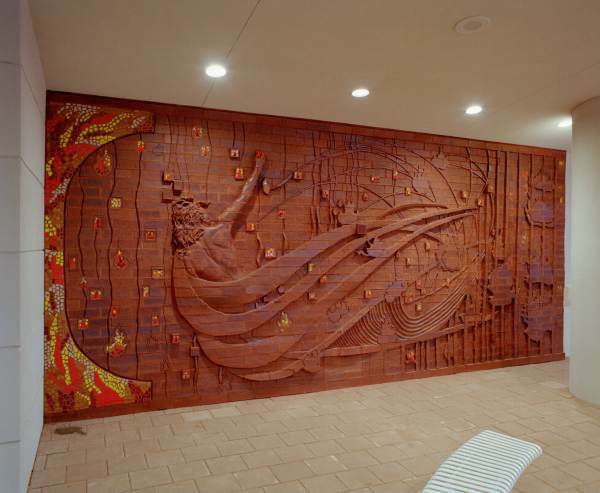 The individually hand-sculpted brick panels incorporate mosaic and glass tiles, centering thematically on the Four Elements: Fire, Earth, Wind, Water. Johnson County Community College, Overland Park, Kansas commissioned the Mise-en-Scène© project in February 1989 for their new Cultural Education Center (classrooms, offices, three theatres, art gallery). 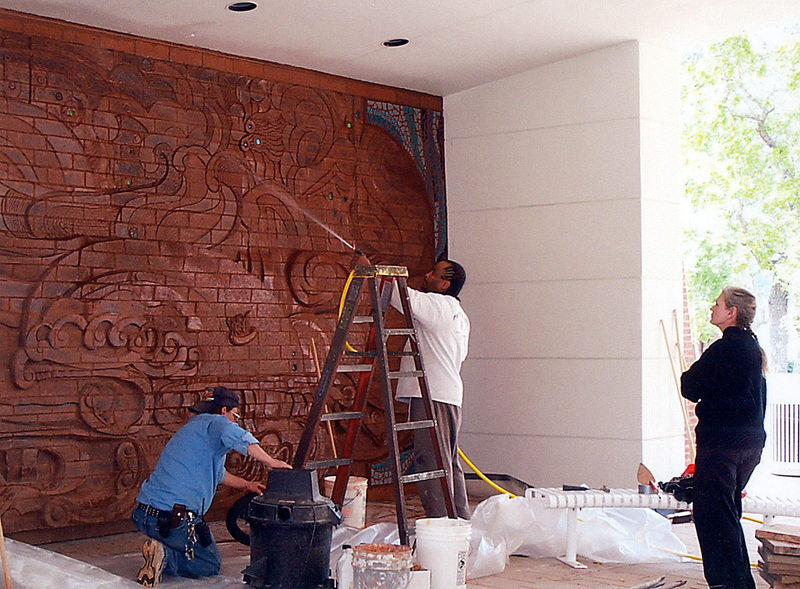 The project entailed 100' of sculpted brick installed on three interior walls (two horizontal; one vertical). The subject theme for Mise-en-Scène© was agreed upon by the college, the project architect (Mark Viets, AIA, Peckham Guyton Albers & Viets, Inc., Westwood KS) and the Sculptor. 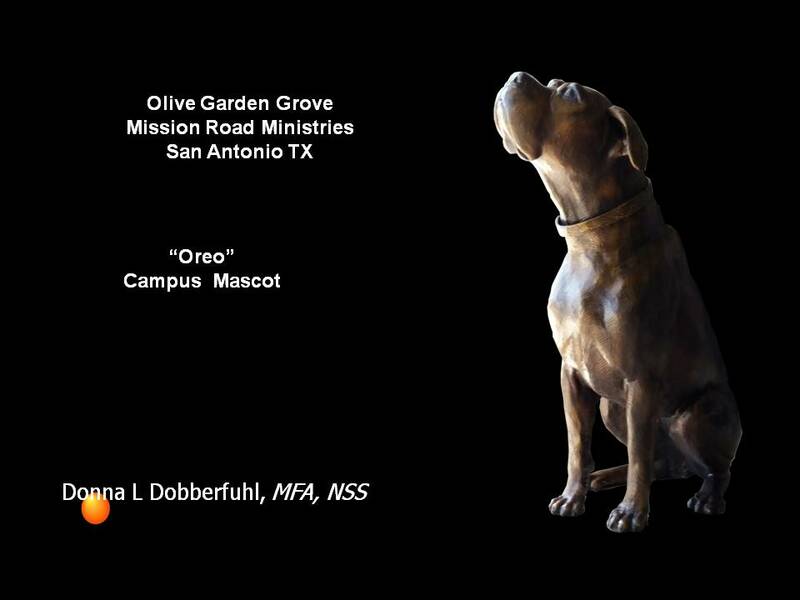 The design was developed by the Sculptor and then approved by the other project participants as well as the campus art advisory board. Mise-en-Scène© includes thirty-two (32) seven-foot-plus theatrical figures that represent the different disciplines and different historical eras of the performing arts. The design works to visualize some of the emotional impact of the performing arts of drama, comedy, tragedy and dance. The bas-relief figures project a maximum 5 ½" from the brick facade. The original brick sculpting was completed at Kansas Brick & Tile Company, Hoisington, Kansas during November and December 1989. All carving was done on a 16' x 10' floor-standing easel. The brick material used for the project was an 8" x 8" x 4" product shape. The complete work used 4,000 brick solids (approximately 20 lbs. each). The brick was handled three times by the sculptor, twice by the brick production plant and once by the masons. Installation took place during April 1990. 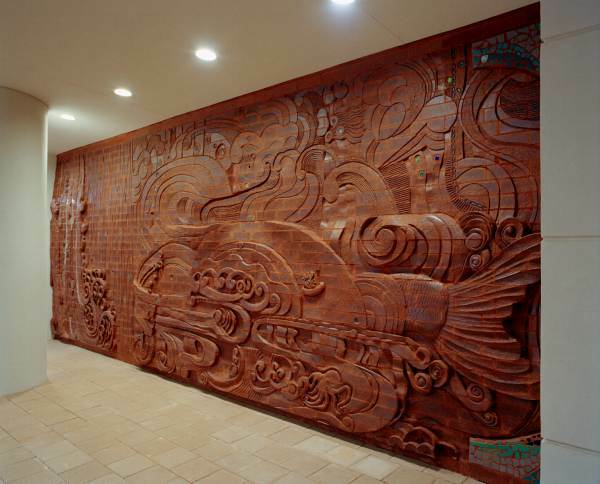 The sculpture is installed throughout the first floor and ground floor lobbies to greet the theatre-goers and to dramatically frame the various theatre entrances. The vertical section of the sculpture rises 35', carrying a collage design up to the building’s second and third floors. This vertical section is placed adjacent to the open staircase, rising three stories. The National POW Memorial, The Price of Freedom: Capture, Incarceration, Capture©, is the United States National Memorial to American Prisoners-or-War, dedicated in 1998. 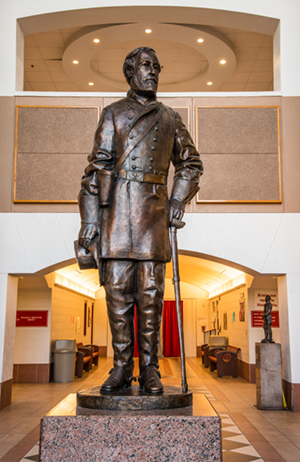 It was developed in connection with the National POW Museum at the Andersonville (GA) National Historic Site. The memorial is sited in a courtyard between the museum and the infamous Andersonville Civil War prisoner-of-war interment camp. "Temple Plaza has been a tremendous success! It has definitely become the prime focal point of Danville. Our Summer Sounds concerts, held on Fridays at Temple Plaza, have become so large that we have to close North Street to handle the crowds." 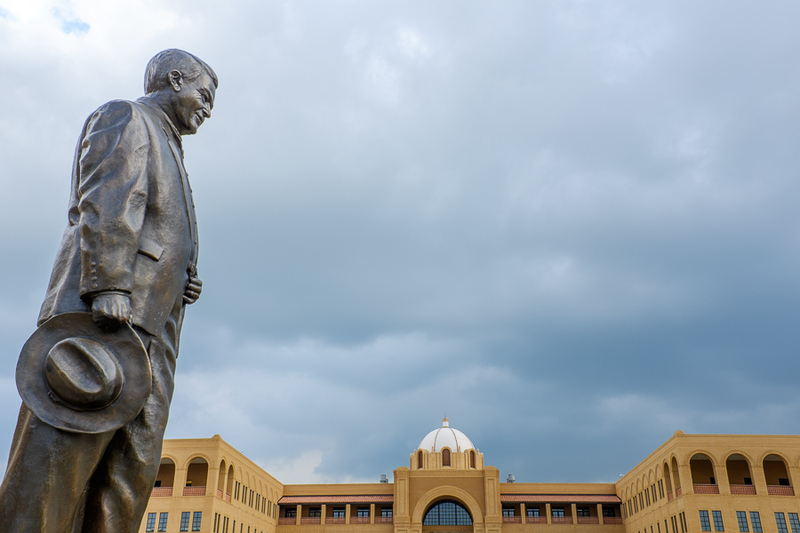 "The success of this project has enabled us to 'sell' other beautification projects to our community. The Walldogs meet in downtown brought signpainting artists from all over the globe to produce 13 historic murals throughout the downtown area. Significant pedestrian and streetscape projects have also been undertaken and completed, following the lead of Temple Plaza and its centerpiece, DanvilleUSA©. 12 sculptural explorations of thought expressed through the figure. but yesterday, I did not know that it would be today." What is beyond likeness is the spirit. is still very much like me. Man In The Moon© is now available. Please inquire for ordering details. 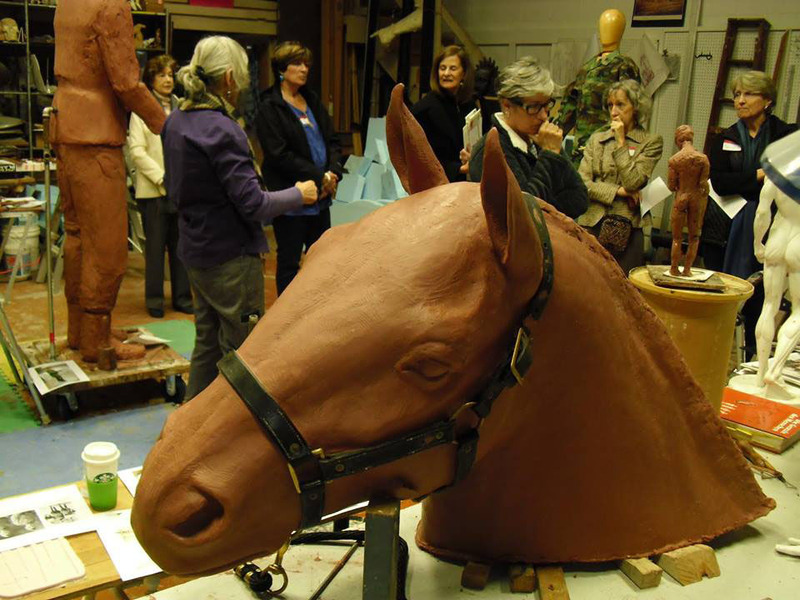 Shown is the completed sculpture and some views of the clay modeling process.